Thank you to all our readers for joining us here for a bloggin’ 2010. We wish you all a happy and prosperous 2011! Two (2) interactive maps and census results demonstrate the Southeastern states’ bright economic future: (1) per capita municipal debt burdens and (2) an analyses of the strengths & weaknesses of their respective business climates. Among the many reasons hummus moved south. The Travel Channel ranks “our” Skyway Bridge #3 in the world, behind only Akashi Kaikyo & Golden Gate. Cultural Differences in decision making, from Professor Michael Roberto. New favorite video: Keynes vs. Hayek. What a blown call teaches us about civility and honesty, and also accountability and brave apologies. Lessons from unusual sources on risk management and persistence and minding the details. A contrarian view on inflation. iPad: phenomenal or just an iPhone with a pituitary problem? The indispensable social contributions of entrepreneurs. Much as I would like to see policymakers encourage more high-growth entrepreneurial activity, I don’t believe that an angel tax credit for SBIR recipients is the way to do it. A capital gains tax cut for shareholders in startups (including angel investor holders of equity) would stimulate more high-growth entrepreneurship with fewer adverse effects than the proposed angel tax credit. In 1981, 70.7% of industrial R&D took place at companies with 25,000 employees or more. By 2005 that had fallen to 37.6%. At the same time, companies with fewer than 5,000 employees accounted for 39.6% of industrial R&D in 2005, up from 10.5% in the early 1980s. From the same data we learn that companies with fewer than 500 employees account for just 11% of sales (of R&D-performing firms) while employing 25% of the scientists and engineers. The large (>25,000) firms enjoy 43% of sales while employing only 29% of the scientists and engineers. Over the past three decades it has become more common for small companies to plant while large companies harvest – often by acquiring the same small companies in order to create economies of scale for the innovation. This is a good change for the economy, and fueled in no small part by the growth and success of angel investors (and venture capital firms) who allocate capital more efficiently. These activities should be encouraged with tax credits, rate reductions… or both. Good advice – even if it does just so happen to coincide with his product offering. A good CEO-VC partnership will expand – exponentially – the network that gets put to work on behalf of growing the business. Ballast Point Ventures is pleased to announce that it has sold its remaining interest in Fund I portfolio company, QOL Medical, LLC, in a minority recapitalization led by QOL’s largest shareholder, Cooper Capital. Under the terms of the all cash transaction, Ballast Point Ventures and the Company’s founders, Trevor Blake and Edwin Hernandez, will sell all of their interests. Edgemont Capital Partners served as the advisor to QOL on the transaction. Would it be a Bowie Knife? 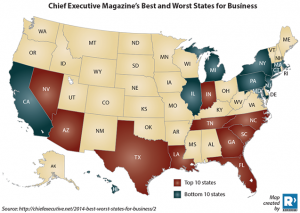 Kotkin suggests 2010 will be used by future historians to mark the end of the California era and the beginning of the Texas one, citing as evidence this survey in Chief Executive magazine which ranks the states for their business environments. CA not only ranks last, but is the only state to receive an ‘F’ in any category. Even more revealing is California’s diminishing preeminence in high-tech and science-based (or STEM–Science, Technology, Engineering and Mathematics) jobs. Over the past decade California’s supposed bulwark grew a mere 2%–less than half the national rate. In contrast, Texas’ tech-related employment surged 14%. Since 2002 the Lone Star state added 80,000 STEM jobs; California, a mere 17,000. Of course, California still possesses the nation’s largest concentrations of tech (Silicon Valley), entertainment (Hollywood) and trade (Port of Los Angeles-Long Beach). But these are all now declining. Silicon Valley’s Google era has produced lots of opportunities for investors and software mavens concentrated in affluent areas around Palo Alto, but virtually no new net jobs overall. Empty buildings and abandoned factories dot the Valley’s onetime industrial heartland around San Jose. Many of the Valley’s tech companies are expanding outside the state, largely to more business-friendly and affordable places like Salt Lake City, the Research Triangle region of North Carolina and Austin. … Ultimately the “green jobs” strategy, effective as a campaign plank, represents a cruel delusion. …Without subsidies, federal loans or draconian national regulations, many green-related ventures will cut as oppose to add jobs, as is already beginning to occur. The survivors, increasingly forced to compete on a market basis, will likely move to China, Arizona or even Texas, already the nation’s leader in wind energy production. By the way, we have nothing against California. It’s a beautiful state and a great place to visit. We just wouldn’t choose to try and build a business there. The October issue of Start-Up magazine includes an article on growth opportunities in the 25-year old field of sleep medicine – an enormous group of serious and chronic diseases that remain largely undiagnosed. The most common current diagnosis and therapy are expensive and suffer from a high failure rate – 50% of patients abandon treatment within the first year. Even those who stay with the treatment regime fail to meet very low compliance standards, through misapplication of the device or removal of same in the middle of the night. Watermark provides a medical device and software platform which empowers primary care physicians to prescribe home sleep tests, addressing the 90% of patients with undiagnosed (and therefore untreated) Obstructive Sleep Apnea (OSA). The advantages to home-based sleep testing are simple: increased patient comfort and compliance, improved diagnostic speed and accuracy, and lower cost. Home-based, end-to-end, diagnostic-to-therapy platforms are a growing trend in health care. Sean and his team at Watermark are already experienced in providing home-based monitoring from their success at PDSHeart (a previous portfolio company in our first BPV fund), a leader in the remote cardiac monitoring space. …an array of technology-enabled, consumer-based services that provide a new form or primary health care [that] emphasize early detection, prevention, and management of chronic disease. …shift a lot of the diagnosis, monitoring and treatment of disease from hospitals and specialized clinics, where treatment is expensive, to primary care physicians and patients themselves — at far less cost. The article further concludes that additional chronic conditions such as heart disease and diabetes could also someday be monitored by Web-based personal devices similar to Watermarks’ ARES (Apnea Risk Evaluation System). It is exciting to partner with entrepreneurs like Sean who are at the forefront of efforts to use the latest technology to simultaneously increase the quality and reduce the cost of health care in this country. The October 2010 issue of Florida Trend includes an excellent feature on a critical piece of the state’s entrepreneurial ecosystem: local groups of investors providing funding to emerging companies. For entrepreneurs, it’s the smartest money you can get. You could be getting 40 investors committed to your success who use their networks to grow the company and who will help you find the next round of capital. Historically, Florida has lost companies because they went to venture capital firms who prefer local businesses, and most of those [venture] firms were not in Florida. The Florida Trend article also includes insights from Tim Cartwright of Tamiami Angel Fund in Naples, Barbara Boxer of Women Angels in Miami, Allan Keen of Winter Park Angels in Winter Park, and Alan Rossiter of Springboard Capital in Jacksonville.